The DC Comics New 52 debut Hawk and Dove: First Strikes had the elements for success. Sterling Gates had written character-heavy stories in Green Lantern Corps and especially Supergirl, such to suggest he could explore well Hawk and Dove's often-complicated private lives. Rob Liefeld, love him or hate him, was there at this Hawk and Dove's "old" DC Universe conception, and brought a sense of legacy and continuity to the title. These elements never quite come together, however, before the title is cancelled at the end of this volume. Gates's story has potential but doesn't distinguish itself before Liefeld takes writing chores. Liefeld's art starts relatively strongly but loses detail as the book continues, and his writing equally lacks the verve needed for modern audiences. By the end, First Strikes is just not all that interesting, and its cancellation seems right and justified. Sterling Gates's issues of Hawk and Dove see the duo fighting rival bird avatars trying to steal their power, while also dealing with fissures in their own partnership. Hawk and Dove's relationship to the Lords of Order and Chaos who granted their powers has been explored before, but Gates hints at a mythology involving a War Circle of avatars like Hawk -- and at the same time, that Dove's powers may come from somewhere else, and that her abilities may be greater than she or Hawk knew before. More compelling than new villain Condor and the War Circle, however, is Gates's depiction of the interaction between Hawk Hank Hall and Dove Dawn Granger. Their partnership, here at the beginning of the newly-rebooted DC Universe, is thornier than in their old title's later years -- often they're fighting their enemies side-by-side but not necessarily together. Hank resents Dawn replacing his brother Don as Dove; he also worries that Dawn's boyfriend Deadman may hurt Hawk and Dove's effectiveness, even as he purposefully tries not to be too involved in Dawn's personal life. Dawn hides a new secret past that involves some connection to Don (never, unfortunately revealed in this book) and struggles to balance her role as peacekeeper with her more violent tendencies. That Hank and Dove are young, conflicted, and represent different approaches to superheroing has always made them compelling; all of this is a sound foundation with the potential to drive the series forward. But Gates's story takes five issues to unfold, including two set at a White House banquet that are almost entirely an action sequence. There are nice touches here for Hawk and Dove fans -- the appearance of old characters like Hank's father and ex-girlfriend Ren, and a mention of Dawn's old boyfriend Sal -- but the story moves slowly. Condor largely tells Hawk and Dove about the War Circle in exposition, such that it's not vivid as a story piece, and there's few other supporting cast or subplots for Hawk and Dove to feel like a fully-realized world. For the last three issues, Rob Liefeld writes as well as draws. Liefeld gets points for a generally smooth transition -- even as First Strikes's plot begins to go in a different direction, Liefeld roots it in the War Circle mythology, such that it would be easy to think Hawk and Dove has just one writer overall. Liefeld's first solo issue, however, is an unremarkable Batman story; Hawk and Dove are sporadically lectured and praised by Batman, the kind of Batman story that readers have seen hundreds of times and that could as easily have starred Hawk and Dove as Booster Gold or any other second-tier hero. In Liefeld's second and third issues, he pits Hawk and Dove against the sorcerer D'Khan and his henchman, the Hunter; these are silly characters who speak in clichés and whose costumes are severely dated, and by the end there's little in the book to interest a modern reader. When First Strikes ends, to some extent, it's a blessing. It becomes difficult to actually "see" Rob Liefeld's art, to separate one's opinion of what's actually on Liefeld's page from the work he's done before or his own exaggerated persona. Comic book art need not be proportional nor anatomically correct, nor are artistic tics necessarily a bad thing -- Liefeld demonstrates here a tendency toward open mouths and clenched teeth, but this is no better or worse necessarily than Walt Simonson's squarish heads, Barry Kitson's solid-shaped hair, or Gary Frank's pointed chins. There are times in First Strikes where Liefeld's work is quite outstanding, often it seems when the artist has relaxed a bit -- his Dove on the book's cover, if one ignores the over-stretched Hawk next to her; or the scene where Hawk and Dove question Condor in a police station, where the de-powered villain looks quite menacing. Where Liefeld's art begs detraction, instead, are instances like the Batman chapter, where Robin Damian Wayne is almost the size of Dove -- as if he were Red Robin Tim Drake and not Damian -- until he shrinks no larger than Dove's thigh in the final scene. There's also a sequence where the villain Blockbuster tries to steal an amulet from Hawk -- Liefeld doesn't draw the amulet at all until pages later when it suddenly appears around Hawk's neck just as Blockbuster grabs it. Liefeld's panels are the most dynamic especially in the book's first issues; afterward, a variety of inkers (including Liefeld himself) give the black lines a sketchy look that lessens the impact of Liefeld's figures. And Liefeld's character designs, especially toward the end of the book, hearken too much to the nineties to be useable now. The original Hawk and Dove series by Barbara and Karl Kesel was a fan-favorite, and the title's New 52 resurrection in Hawk and Dove: First Strikes was equally welcome. Much like the DC New 52 Static Shock, one has to hope that the characters have enough life to them that they can survive what was simply not a strong enough debut. Neither Gates nor Liefeld did anything wrong necessarily -- in comparison to Static Shock, Gates and Liefeld's book is cogent, just not exciting, whereas Static failed to tell a clear story month to month. 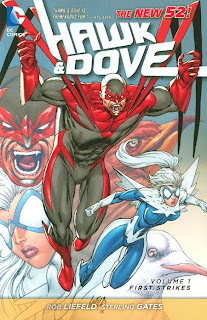 Given all the work done by Geoff Johns and others to bring Hawk and Dove back to the DC Universe proper after years in limbo following Armageddon 2001 it would be a significant shame for these characters to fall by the wayside again for good. Next week -- the DC Comics New 52 Deathstroke is full of blood and ... irony? Batman: The Dark Knight is the best team book you're not reading? New reviews coming up -- be here! Here's my big question about the New 52: How many of these stories could have been told without the relaunch? With a lot of these, it feels like with some character juggling and retcons, it wouldn't be too hard. It's really blatant with the Batman and Green Lantern books, which basically ignore the reboot despite some of the questions it raises (like my issues with how Emerald Night occurred). The one that stands out is Batgirl, and even then, DC wanted to heal Babs years ago. The Hawk and Dove could have stood without the relaunch -- this seems to be Batman's first meeting with the duo, and there's some talk about how Hawk and Dove haven't be operating that long -- but at the same time Dove is dating Deadman (a la Brightest Day, though Brightest Day isn't mentioned), and there's some reference to characters in the original Hawk and Dove series, so this book is kind of a relic of the old DC Universe. The new Batgirl series couldn't be told as well, I don't think, if not for the relaunch. Having "our" Oracle suddenly become Batgirl again would have implications for the Birds of Prey, for Batgirl Stephanie Brown, Nightwing would have all sorts of issues, the JLA, etc., etc., to the point where the focus wouldn't have been on Barbara Gordon herself -- losing some of the chaff was a benefit for that one. Others probably didn't "need" the relaunch per se: Animal Man, Swamp Thing, Demon Knights, Static Shock, etc. Is your point that DC could launched these titles or created a line-wide relaunch a la Marvel Now without necessarily rebooting continuity? I don't personally think that would have been as successful. One Year Later did not have the same effect (though granted it didn't have a media push); keeping all the continuity, even if only vaguely referenced, would have been a turn-off to creators and new readers; and whereas some titles like Batman and Green Lantern didn't need a large-scale reboot, I think relaunching the Justice League as the world's first heroes and moving the JSA to Earth 2 is a big shot in the arm that those titles needed -- even if not every title has received new continuity, the new construction of the DC Universe is a powerful tool for storytelling going forward. I haven't read Green Lantern: New Guardians, neither the first trade nor the zero issue, but does Kyle Rayner's origin no longer match up with Hal's time as Parallax (the truncated five-year time span notwithstanding)? CE, it was nice to see a true "critique" of Liefeld, with both positives and negatives, than the usual bashing that he receives from the Internet fans (myself included!). He still has his fans, although I don't think he has a whole lot of drawing power anymore on a Big 2 book (not that it sounds like he'll be working for the Big 2 ever again). Regarding the New 52, I think it was another case of DC wanting to make their characters younger (in addition to the "marketing gimmick" of a full relaunch - which based on sales numbers was successful, at least for now) and getting rid of some "storyline baggage". Superman and Lois aren't married anymore, Flash isn't married anymore, Green Arrow isn't an old hero who's divorced and done so many bad things in his time that it's hard to stay likeable. Hal Jordan and Bruce Wayne are also younger now, despite the GL & Batman stories still being in continuity. For me, as I've said before, it really comes down to what they DO with these characters in their new status quo. Sure, it's weird to have Clark and Barry single again, and heck yes it would be dumb to copy the same romantic stories that they did (and "everyone read") years ago. No one wants to read new versions of the same old stories that they're familiar with. The goal has to be to take advantage of the new "freedoms" of the characters and TELL GOOD STORIES with them. In the same way that we can read The Dark Knight Returns and Kingdom Come and enjoy their alternate versions of our favourite characters, we can read the New 52 and enjoy these new versions of our favourite characters. We can also go back and read those many many issues of our "favourite versions" of our favourite characters from the Pre-Flashpoint (or even Pre-Crisis!) universe. So, could many of these stories have been told without the relaunch? Yes, many of them could (certainly a lot of the relaunch titles - such as Hawk and Dove - seem to spin out of the Pre-Flashpoint Brightest Day series). The New 52 was about streamlining the continuity and dropping some elements of characters that couldn't otherwise be dropped in the current continuity (what were they going to do - have Clark and Lois get divorced? Kill Lois?). Make the characters younger, and keep them accessible and relatable to a new generation of readers. My broader point is that I'm just really, really tired of relaunches, reboots and reimaginings. Every time I see a "Season One", I cringe, and having yet another "Zero Issue Month" is just a bad flashback to the early 90s. Did we really need Fantastic Four Origin Story #7? And that's a conservative estimate. I enjoyed the Johns/Lee Darkseid arc of JLA, but it all just felt unnecessary when I can go back, read "JLA: Year One" and see the best version of the team's creation, or read "Final Crisis" or "The Great Darkness Saga" for a great Darkseid story. There are some great new ideas from the New 52--I love Batwing, for instance--but a lot of them feel like they could've been done without a mass reboot. @Doug - That's a fair point -- I cringed when DC released Superman: Secret Origin, because indeed I couldn't see that we needed an umpteenth origin of Superman versus just telling good stories. Where the relaunch succeeds, I think, is in making the "Big 7" the first Justice League again (Martian Manhunter notwithstanding) and the world's first superheroes; in making an African American character, Cyborg, a charter member of the League, and so on. But I do agree it's time to stop telling origin stories and start telling story-stories. How much of this has to do with Smallville's residual success -- a ten-year origin story, as it were -- or the popularity of superheroes in movies (very, very often origin stories) is up for discussion. Is it fashionable to tell stories other than origin stories these days? @Mark - I know there's plenty more Liefeld volumes coming down the pike; other people's critiques are their own business, but I couldn't go the "Too many pouches! Too much teeth route!" I mean, Walt Simonson's art doesn't look like Dan Jurgens's, George Perez's, or Jerry Ordway's, and yet Simonson is a master, right? So I'm going to try to be leveled as I read the various Liefeld titles -- this is good, this is dated, this was a mistake, etc. -- because I know you can find the opposite in other places. And about the reboot, I do agree with you above, it brought back the Big 7 to the front scene, as strongly as the Avengers "on the other side" at Marvel. But I'm still not happy about the way they ditched J'onn, a classic and such an important member of the League, over another book... He was and will always be "the constant" of the various JLA iterations!